To renew membership simply click on the Renewal-Returning Member Page to the left, new members complete our on-line membership application, and click to submit your application. The membership chair will complete the remaining process. After completing your application, print your email invoice and return the required applicable fee to DFW-ALTA Corresponding Secretary at our P.O. Box 130024, Dallas, TX 75313-0024. You will be prompted to pay by credit card online using PayPal or by sending in a check via regular mail, make sure you include a copy of the email invoice if paying by check. After we have received your funds our membership chairman will review your application and provide notice to you and of your current status and that your application has been approved. If your company has six or more joining or renewing DFW-ALTA Memberships, they will receive a DFW-ALTA Membership discount, every sixth (6) DFW-ALTA Membership is free. Don't forget to utilize the 2017 6th Member Free Form. 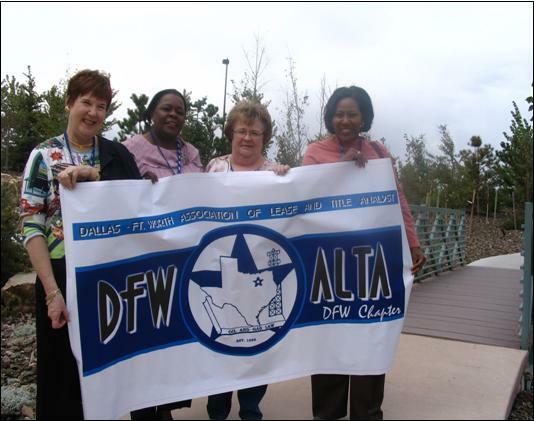 There are four membership types within DFW-ALTA. Retired: Retired Membership may be conferred upon any applicant who is not actively employed in the oil and gas industry and is at least 62 years of age, and has been an active member of the National Association of Lease and Title Analysts (NALTA) or an affiliated local chapter for 10 consecutive years immediately preceding the submission of an application for Retired Membership status. The DFW-ALTA Board of Directors may confer Retired Membership upon the applicant after the approval of the application. Said Retired Member will pay dues equal to one-half of those paid by active members, and shall be entitled to all of the rights and privileges of an active member. (dues reduced by one-half) ($15.00 U.S. Dollars). Honorary Life: Honorary Life Membership is awarded by the Board of Directors. This membership is conferred upon those persons whom the Board of Directors feels have rendered outstanding service to DFW-ALTA or made noteworthy contributions toward the establishment of lease and/or title work as a profession. An Honorary Life Member shall be eligible to vote, to hold office and to chair a committee. (no dues) ($0.00 U.S. Dollars). DFW-ALTA will no longer be accepting NALTA membership dues for annual renewals from its members. Any payment of 2017 NALTA membership dues received by DFW-ALTA will be returned to the member with a request to re-issue separate payment for dues to NALTA & DFW-ALTA.